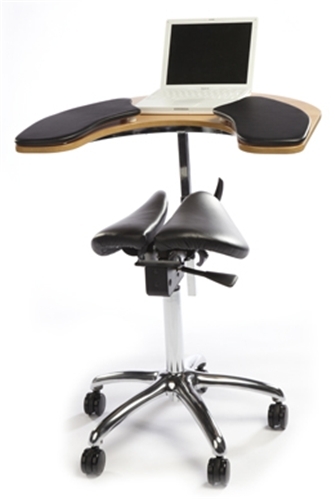 A compact workstation offering the health benefits of saddle sitting combined with an integral ergonomic wrap-around workstation. Ideal in confined work spaces and for laptops in both office and home. Saddle stool sold separately. The Salli Elbow Table offers all the health benefits of saddle sitting combined with an integral ergonomic wrap-around workstation. Ideal for confined work spaces in both office and home. Recommended as a mobile workstation for schools, lectures and training events. 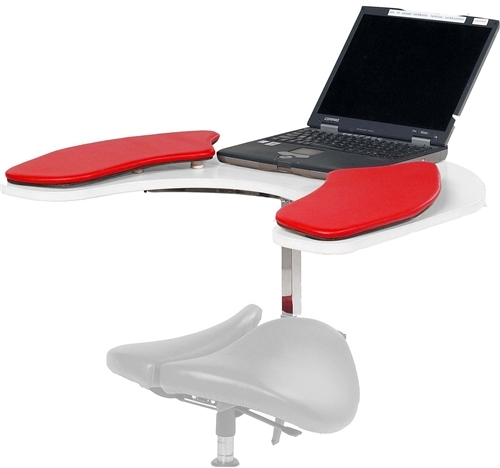 Also works well as a rehabilitation aid, as a workstation for people with balance disorders, and in control rooms. Available for non-tilting Salli Classic and Salli Twin Saddle Chairs. 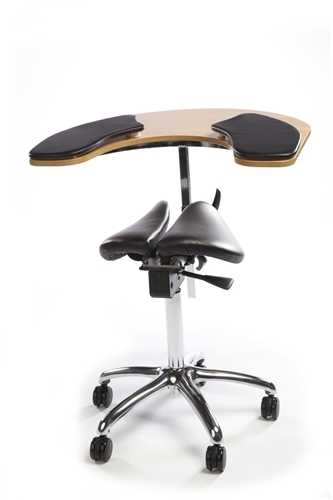 Quality beech veneer table top wraps around your body creating an efficient compact work area. Tabletop dimensions: 29.5" x 24.4" x 0.7" (75 x 62 x 1,8 cm). Includes thin, low profile leather elbow pads. Optional thick adjustable leather armpads. Important! The Salli Elbow Table cannot be attached to a tilting seat. Important! Salli Saddle Chairs purchased separately have a smaller diameter 5-star base. If this is a retrofit installation, the chair base must be replaced with a larger one.